Fast powerful relief. 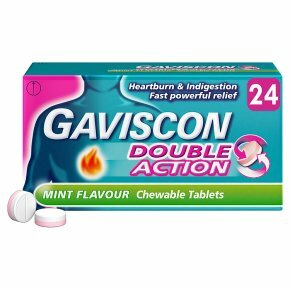 Heartburn & indigestion.Sodium alginate Sodium bicarbonate Calcium carbonate Gaviscon Double Action Peppermint Tablets bring long lasting relief from the pain and discomfort of heartburn and acid indigestion. They get to work in two different ways: 1) Neutralising excess stomach acid to relieve pain and discomfort (white layer) 2) Forming a protective barrier over the stomach contents to soothe the burning pain in your chest (pink layer) What are these tablets? The tablets do not contain sugar or gluten. You can take this product if you are pregnant or breast feeding. Dosage: For oral administration. Chew thoroughly before swallowing. Read the package leaflet before use. Contains aspartame (E951). If you have phenylketonuria, note that the product is sweetened with aspartame (E951), a source of phenylalanine. Contains carmoisine lake (E122). Adults and children over 12 years: When symptoms occur take two to four tablets after meals and at bedtime, up to four times a day. Children under 12 years: Should only be taken on medical advice. WARNINGS: If symptoms persist after 7 days consult your doctor. Contains sodium and calcium. If you have been advised to follow a diet restricted in either of these please consult your doctor before taking this product.<br>Medicines should not be disposed of via household wastewater or household waste. Ask you pharmacist how to dispose of medicine no longer required. These measures will help to protect the environment.<br><br>KEEP OUT OF THE SIGHT AND REACH OF CHILDREN.